Husky Education - The Watch Dog! Adopters: Please Update Your Info Instantly. 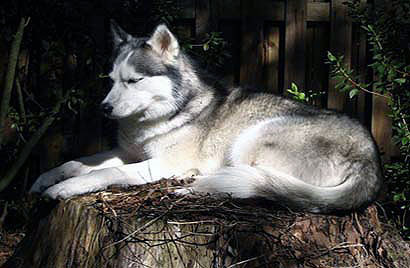 Siberian Huskies are pack oriented, which makes them extremely sociable by nature. Because of this trait they are relatively useless as watch dogs. The fact is, if a burglar broke into your home when you where not there, your Sibe would show him where all the good stuff is and bug the burglar to play or feed him/her. The most harm they would do is kiss and/or lick the burglar to death. On a lighter note, because the breed is very pack oriented, they are happy to make friends with just about anybody they meet. There are some Siberians who are exceptions to the rule. This is why it is so important for any dog to become well socialized with lots of different people and dogs in all sorts of settings. This way they are more relaxed and will not stress or fear change. When they are comfortable meeting new dogs or people, you can feel comfortable taking them on vacation with you or having a friend puppy sit for you at their home while you are on vacation. Many people mistake Siberian pack oriented behavior for that of a watch dog's. Because the breed bonds so tightly with their "pack" (this could be other dogs, humans or both) they do sometimes defend or are wary of strangers who enter the house where their "pack" is present. At those times when the cable guy or phone guy comes to your home to do his work, your Siberian may stand between you and that stranger and give him the "look" as if to say, "Don't you dare try and touch my Mommy if you still want to work here". Because of this some people mistake the breed for watch dogs, they are NOT. They may defend their pack but could care less about your DVD player or TV. Kiona has a perfect view of her yard from her stump tower, hmmm... now if she could just stay awake. We are in desperate need of Foster homes to help save more Siberians from neglect, abuse, abandonment and illness. We can not save these precious fur balls without your help. If you can open your heart and home to just one fur ball you can make a difference! By becoming a Foster you are not only saving a life, you are helping give a Siberian a chance at a new home...a new life! Can you look into this fur babies eyes and not want to help? Click HERE to find out more!